Because we haven't watched the "Deathstroke" trailer for Arrow enough times while we wait for Episode 18 to air, some clever fan gave us a new way to view it... in LEGO form! Yeah, we're scraping for new material at this point, but the video is actually really clever, pulling scenes from the excellent "Deathstroke" trailer and recreating them with LEGO. Here's the original trailer for reference. 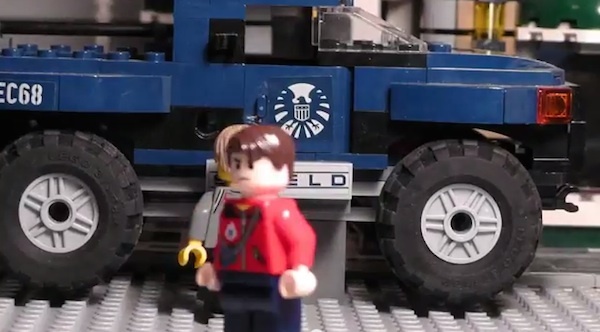 I do believe that's a S.H.I.E.L.D. vehicle there. Let's get serious for a minute here though, because "Deathstroke" is supposed to be a big episode. And it's one that comes before another break between episodes (one week off from new eps before the series returns with "The Man Under the Hood"). TVLine just ran an article that quotes Arrow producer Marc Guggenheim as saying that "Deathstroke" was written "to function almost as a season finale. Obviously we're doing five episodes past this, but this one is really, really, epic." Just how epic are we talking here? Guggenheim teases Slade Wilson's complicated multi-part plan to take everything away from Oliver, including everyone he loves and his city, "and then kill him." This apparently involves a plan that is "completely unexpected." So... yeah. As if we needed more reason to be excited for the next hour of the CW drama, there's that intriguing tease. Of course, we might have assumed Slade had something complicated up his sleeve, beyond simply snatching up Thea. But it sounds like Oliver won't see Slade's full plan coming. It makes me nervous. But I can't wait to see what's revealed this week. And at the very least, this isn't the season finale. So whatever happens on Wednesday night, we'll get some followup two weeks from then. OLIVER’S WORLD STARTS TO CRUMBLE — Slade (Manu Bennett) makes his move against Oliver (Stephen Amell) and the repercussions are enormous. While Oliver scrambles to protect his family, a key player in his team starts to question Oliver’s decisions. Meanwhile, Isabel (guest star Summer Glau) makes her move to take Queen Consolidated away from Oliver. Guy Bee directed the episode written by Marc Guggenheim & Drew Z. Greenberg (#218). And be sure to see our dissection of the actual trailer here!